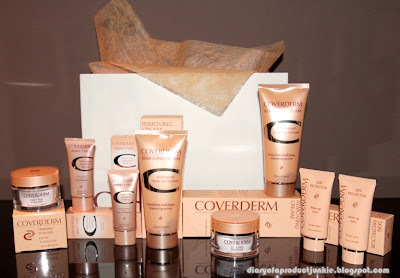 Coverderm: The First Camouflage Foundation Ever! Hello, lovelies~ Flawless skin is one of the main goals to be achieved in the makeup world. We strive to find out every technique and product that is able to make our skin look flawless in front of the camera. Skin care is important, but whilst we wait for skin care to take place, why not use makeup to conceal our imperfections for timed flawless face? 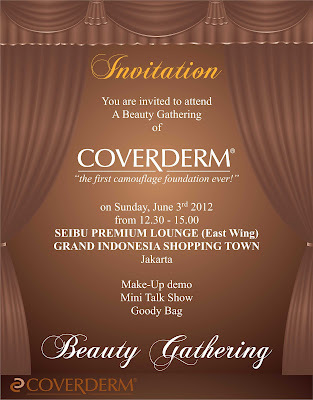 Last Sunday, 3rd of June 2012, I was given an invitation to a Beauty Gathering at Seibu Preium Lounge, Grand Indonesia from Coverderm (via the lovely IBB girls). The invitation announce the launching of their first camouflage foundation. 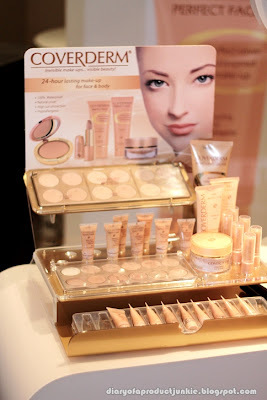 If you've read my blog long enough, you'll know that I am a foundation aficionado, so I was excited to go. The event started with a talk show about common skin problems that women have, such as blemishes, acne scars and hyperpigmentation. While it is best to treat it with various medical procedure or creams, it would be better to have it concealed (only if you want to) with a makeup line that is safe for the skin and won't clog the pores. 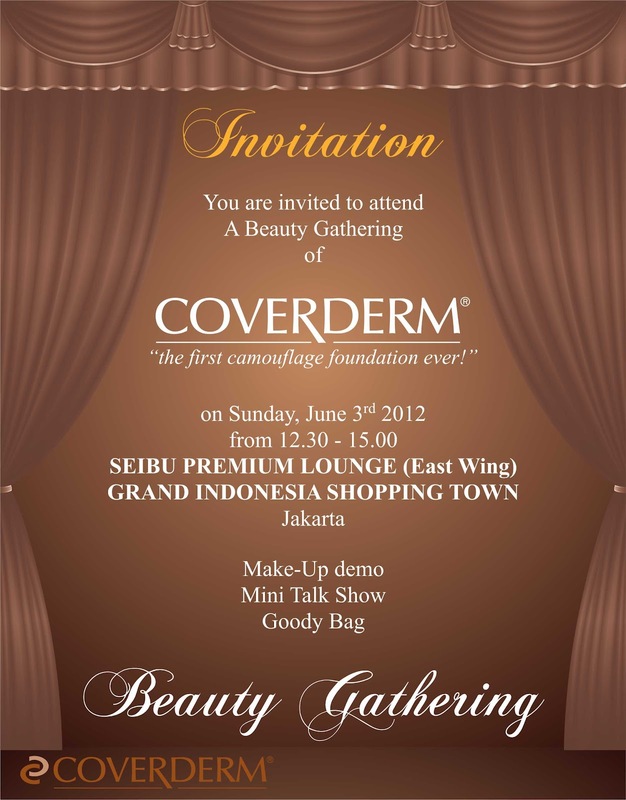 After the talk show, there was a makeup demo performed by makeup artists from Coverderm. 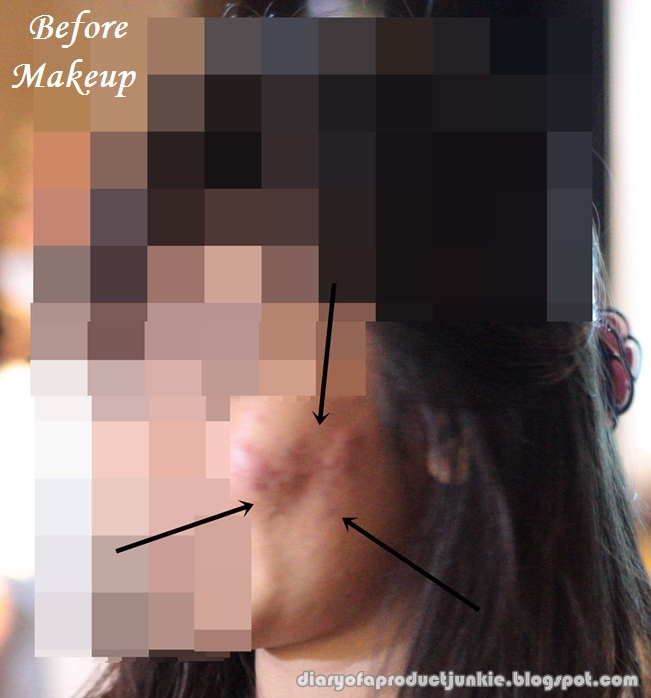 There was a model who had scars on her left cheek complete with elevations and discolorations. The challenge was to make her face look more even toned and even conceal the whole scar. I had to blur out the face of the model for privacy purposes. 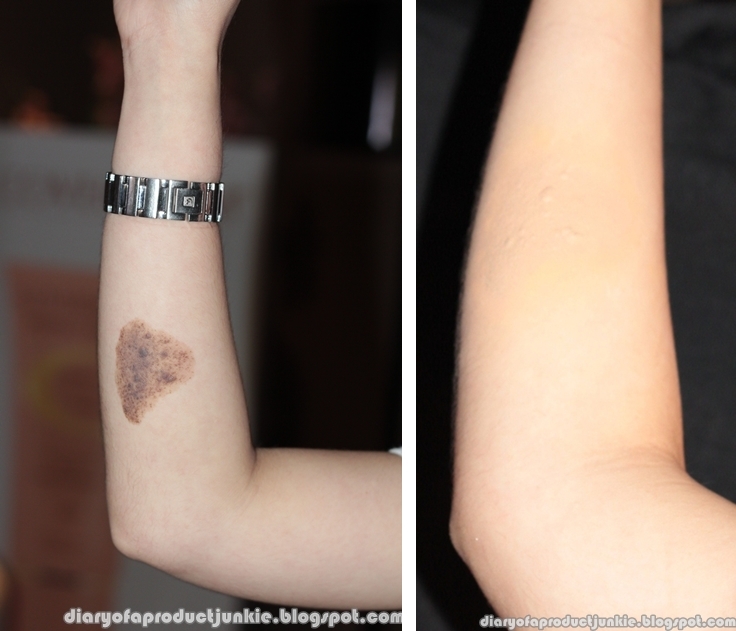 However, I hope you can see the arrow pointing to the discolored scars. The makeup artist prepped her skin with Coverderm Skin Basics, which is a multivitamin cream that will help moisturize her skin well, hence better makeup application. 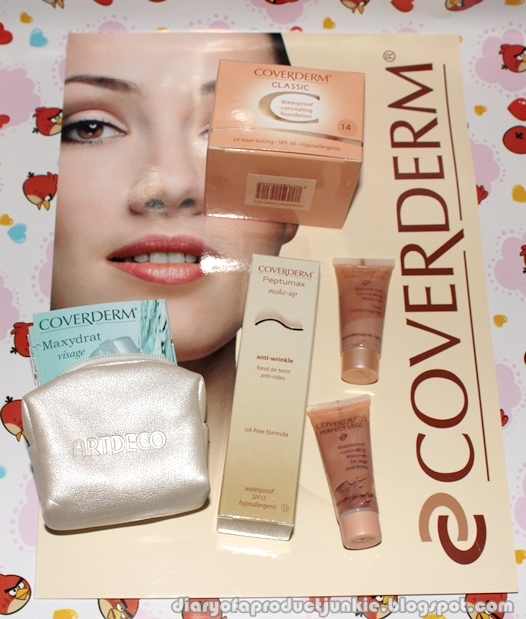 She continued to apply Coverderm Skin Protector, which is a makeup base. With all the skin prepping completed, she moved on to makeup. 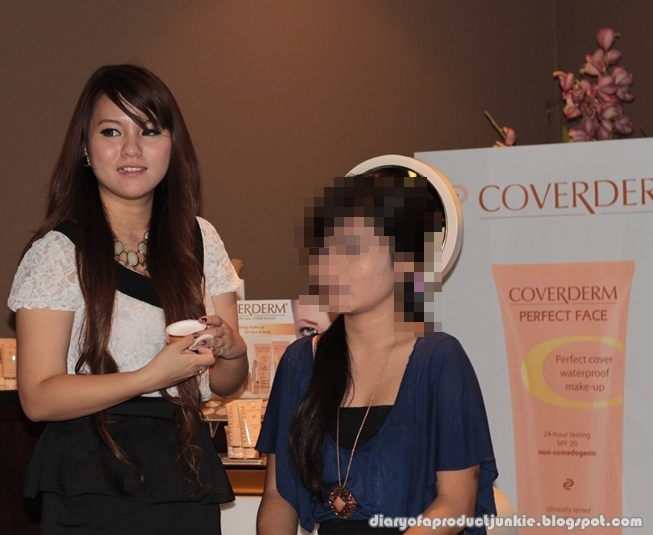 She applied Coverderm Classic Concealing Foundation delicately on the model's skin, carefully concealing all of her imperfections. For application, she preferred to use her fingers because blending is much easier, but if you want to use to brush or a sponge, feel free to do so. As she was doing makeup on the model, another makeup artist explained the products more in depth and answered some of our questions. The last touches were done and voila! You can see in the picture above that the model's discolorations on the cheeks were completely even toned after the foundation. Here is a closer look on the scars. Notice that in the before picture the discolorations (hyperpigmetations) were crystal clear. 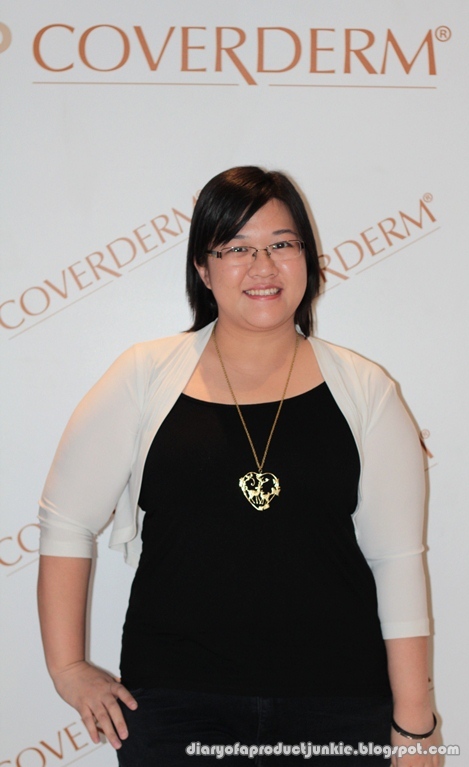 After the Coverderm Classic Concealing foundation is applied, her skin looked more even in terms of skintone. some of the active acne were concealed perfectly with the combination of foundation and Finishing Powder. The results are really good, huh? 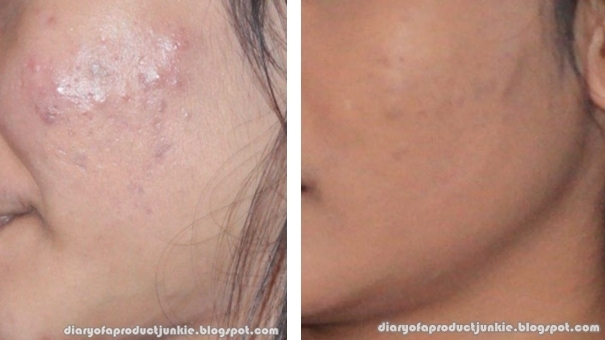 I'm blown away by the ability of the foundation to conceal such severe acne scars and discolorations. The foundation is also able to conceal a birth mark, albeit the bumps are still there, but the discolorations were evened out. Looks really promising, doesn't it? 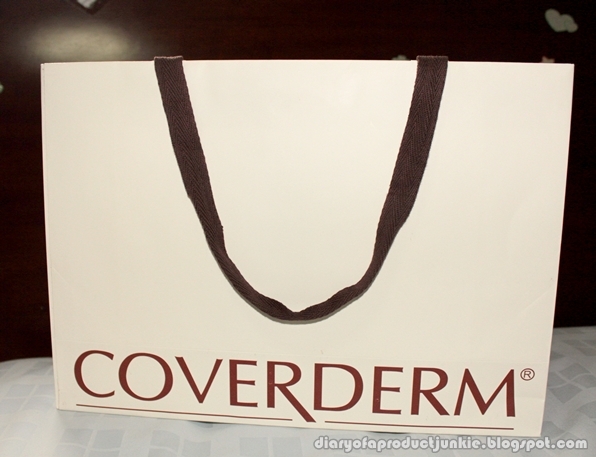 Well, Coverderm provides products that will help conceal imperfections on the face or on the legs. The Coverderm Classic foundation has 14 shades! That's remarkable since most foundation nowadays only comes in 4 or 5 shades, so there is a chance of a shade for everyone. 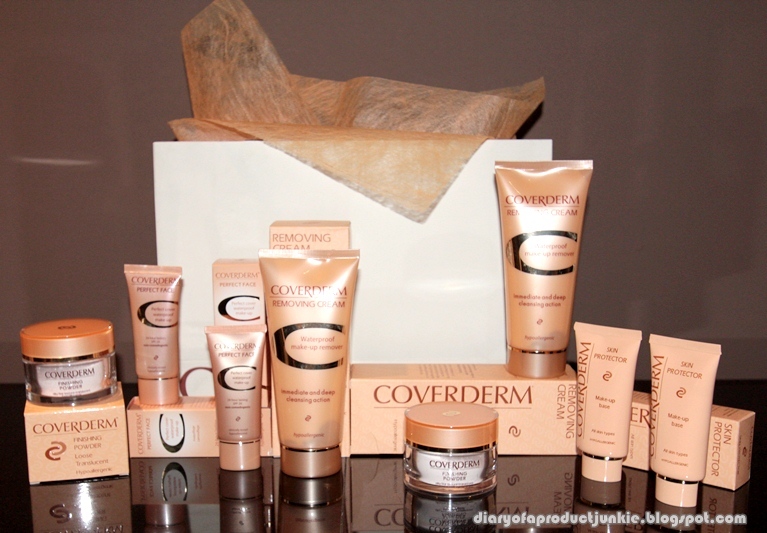 Coverderm was kind enough to give us a goody bag, with a foundation, BB cream, concealer and loads of packet samples. I can't wait to try them out! Thank you for such a relaxing ambience at the Seibu premium lounge and spectacular products that dumbfounded me that afternoon. looks really good!! how about the staying power (on oily skin especially) ^^? Sha, it looks promising, isn't it? ya ampuuun ci...yang disensor matanya aja kali...masa 1 muka di sensor, mana keliatan apa2?? Vheii, nanti kalo udah kucoba, pasti di review..